An 80s party provides an ideal opportunity for you and your guests to re-live a decade when the music was big and the hairstyles were even bigger. The eighties costumes are fun, the decorations are easy and the food choices are never-ending. The simplest way to ensure your eighties theme event starts off in style is to use a lot of bright color combinations such as red, turquoise, lavender, grey and pink. Balloons and steamers are an obvious choice. They come in every color of the rainbow and are a great way to brighten up your eighties event. Just about every household I know of has an assortment of old cassette and VHS tapes. How about stacking some of them together to create a funky eighties centerpiece? Another inexpensive idea is to use old album covers if you still have them. Use double stick tape or sticky tack to hang them on the walls, around your food areas and even in the bathrooms. Old posters of eighties rock bands work great too. Do you have any old Rubik's cubes? It's a perfect time to pull them out. Not only are they a great decoration idea but your guests will love playing with them. A fun game to play for an eighties party is to have a wig contest. Have all your guests come in their favorite 80s wig and then let the crowd pick a winner. Afro wigs, bright red, punk rocker wigs and big hair wigs are popular and can easily be found at costume shops and online. 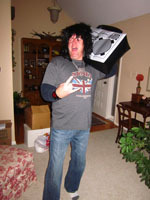 Here's a picture of my silly husband in his 80s attire (a big hair wig that we paid about $20 for and a blow up boom box that was about $15 I think). He's also sporting a Lynyrd Skynyrd t-shirt and a big gold necklace. One of the latest crazes is to play printable games at home parties. Your 80s party is the perfect time to try them out. Our partner, Printable Games A to Z has a nice selection of games that you can download to your computer including "Back in the Day Catch Phrases." Just print as many as you need and you will be ready to play. Find their selection of 80s Games here. Also our visitors have contributed several group games that are perfect for teams of players. So fun and easy to organize! Think Michael Jackson and Madonna. These entertainers were responsible for developing the style that many people tried to emulate then and even now, especially at an 80s party. If you keep these entertainers in mind when searching for eighties costumes, you won't go wrong. For the ladies, Madonna wore alot of jewelry, lace, lycra, big hair, bows and headbands. The main idea here is big. Big bows in your hair, big belts around your waist and lots of chunky jewelry. Eighties attire was also very colorful so look for costume items that are bright including temporary hair dye and two-tone wigs. 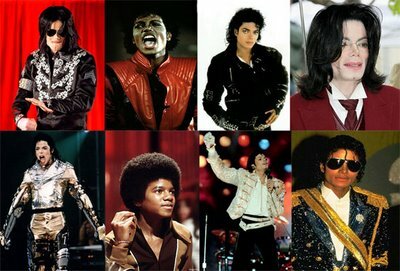 For the guys, Michael Jackson wore a lot of colorful leather, sparkly shirts, loafers, mirrored sunglasses, and if you can find them, Sgt Pepper looking jackets. And don't forget the glove! If you don't want to follow Michael's lead, Google eighties rock bands like Bon Jovi, White Snake and Van Halen. You'll soon understand the meaning of BIG hair. This video shows a still picture of the entire Bon Jovi Band. 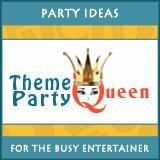 I'm including it here so you get several ideas of how to do up an 80s costume right! Check out the scarf around Jon's head and the BIG hair on every one of them. We already talked about the impact Madonna and Michael Jackson had on eighties fashion but we should also give them credit for the impact they had on the eighties music scene. Personally I owned several 8-track tapes of theirs and wore them out listening to them over and over again, especially Michael's Thriller. Additionally, I was heavily in to eighties rock bands and as a teenager, I went to several concerts in the Detroit and Chicago areas. I saw bands like Van Halen, ZZ Top, Journey, J. Geils, Rush, Pat Benatar, Fleetwood Mac, John Cougar (Mellencamp) and Heart. As an adult, I replaced my 8-track tapes with CDs and still listen to these bands to this day. Finding music selections for my 80s parties is easy because I already have several CDs from this era. If you do not, you can easily find 80s compilation CDs at places like Amazon.com. Click here for a great list of eighties cocktails. You might also like our 70s Theme page and our page on hosting fondue parties at home.